As part of the 2014 hennemusic Rock News Awards, the site is counting down the Top 10 Rock News Artists of the year. KISS began the year as confirmed inductees for the 2014 Rock And Roll Hall Of Fame, leading to speculation about a possible reunion of the band’s original lineup at the April ceremony in New York City. 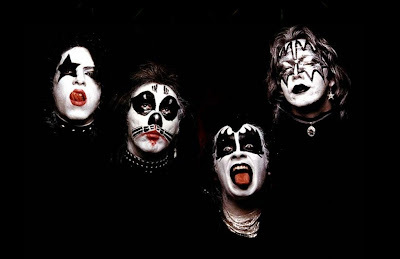 Despite Gene Simmons’ assertion in March of 2011 that KISS would reunite for the event, bandmate Paul Stanley came out swinging in early January saying it would never happen - it was a hot topic approached from many sides all year long. On February 21, original lead guitarist Ace Frehley broke the news that the original band would not reunite for the Rock Hall induction, with Simmons flip-flopping on his 2011 comments three years after he said they would play the event. The tension between Stanley/Simmons and the Rock Hall cranked up to new levels in the month leading up to the April induction, with the Rock Hall CEO Joel Peresman defending the organization’s decision to only induct KISS’ original lineup; Stanley issued a stern rebuttal and Peresman responded in kind. On April 10, the original KISS lineup of Peter Criss, Frehley, Stanley and Simmons were inducted into the Rock And Roll Hall Of Fame by Rage Against The Machine guitarist Tom Morello. Stanley/Simmons refused to have KISS perform, denying fans the opportunity to see the original lineup play one last time as a salute to the band’s 40-year career. Frehley was invited by Morello to play AC/DC’s “Highway To Hell” during an All-Star jam at the end of the event, but it was scrapped after the show ran longer than scheduled. Without KISS’s performance, the focus of the 2014 Rock Hall induction ceremony was on Nirvana, with Dave Grohl and Krist Novoselic closing the night with an impressive set as they were joined by a variety of powerful female singers – including Joan Jett, Kim Gordon, St. Vincent and Lorde. Stanley published his memoir - "Face the Music: A Life Exposed" – in April; the book went on to debut at No. 2 on the New York Times best sellers list. On May 21, KISS performed with American Idol winner Caleb Johnson on the Season 13 finale of the reality series. A week later, Frehley premiered “Gimme A Feelin’” as the lead single to his first album in 5 years, “Space Invader”, due out at the end of summer. On June 23, KISS launched a summer tour of North America with Def Leppard, a trek that would hit more than 40 cities across the continent. In August, Frehley premiered his cover of the Steve Miller Band’s 1973 hit, “The Joker”, just weeks before “Space Invader” hit stores. The same month saw Simmons face a backlash following insensitive comments he made regarding people suffering from depression (he told sufferers “f*** you, then kill yourself”); an Australian radio network pulled all KISS tracks from their playlists across the country, leading Simmons to issue a rare apology. Simmons continued to face public backlash to the incident and his Twitter account was temporarily shut down, with his wife hinting that it may have been taken offline due to ongoing and serious threats. The 65-year old bassist made the remark during a soft interview he gave to his son, Nick, to help his writing career, repeating virtually verbatim comments he’s made to journalists for months....but this time they stuck, leading to several rockers speaking up to refute Simmons claim – including the Foo Fighters and AC/DC. The same interview saw Simmons flip-flop on his opinion on Nirvana’s legacy – without being challenged by his son – reversing comments he made in 2013 about the group. In October, KISS released an expanded, deluxe edition of their 1977 album, “Love Gun”, complete with a bonus disc of demos from the era. KISS launched their first Las Vegas residency on November 5 before hosting KISS Kruise IV. Frehley launched his solo tour in support of “Space Invader” on November 13, while Criss was honored at the Cancer Research & Treatment Fund's Hall Of Fame event in New York on November 18. KISS lip-synced a mimed performance at the 88th Annual Macy’s Thanksgiving Day Parade in New York City and then complained about treatment by the event’s organizers, repeating a refrain from the Rock Hall situation. KISS will perform a Japanese tour next month and a series of South American dates in April before launching a European run in late May.